With one kiss, Tatiana has discovered a love for a man she’d hated—the prince of Natatoria. Through the botched rescue attempt by her father against this union, an army of rebels has revealed their identity and intentions—treason. When the King is fatally injured, Azor takes things into his own hands. No one is safe as mers are forced to choose sides. Betamers take the blame, including Tatiana’s family’s closest friend, Badger, and the punishment is death. Caught between the bond and her true feelings, Tatiana, the future Queen, must overcome the promise to fight for what’s right and uncover the truths of the past or all will become Everlost. Everlost (Book 3) picks up where Everblue (Book 1) leaves us, and along side the events of Evergreen (Book 2), when Prince Azor stole Tatiana's kiss and her choice. Everlost gives us a much deeper understanding of how the promise really affects the ones who have kissed and why. Tatchi (Tatiana) is a very passionate, out spoken, aggressive woman except when she's around Azor. Ever since they were promised, it's almost like she's addicted and needs to be with him all the time. Unfortunately Prince Azor is always extremely busy, running off to take down the rebels, and never seems to have enough time for her. Soon rumors start flying that even a week into their promising, they still haven't consummated the relationship. It feels like Azor is avoiding going to the next level with Tatiana, despite the promise, and the lies start piling up. It was heartbreaking to see how the promise messed with Tatchi's mind and heart after having read Everblue and knowing how much she absolutely hated Azor. There were moments that had me just as confused as Tatchi. One minute, Azor was being a complete jerk and I felt so bad for Tatchi because all she wanted was to be with him. The next minute, he would act the way you'd expect a promised mer to act - sweet, loving. And then just as quickly, I was hating him again! There were some new characters introduced in this book, like Jacob, Tatchi's bodyguard, whom I absolutely fell in love with. I loved the way he was tied in to several characters we'd already met in the previous 2 books in this series. This was one of those books that I absolutely couldn't put down!! (Big surprise, all of Brenda's books have that effect on me!) There was so much action, heartbreak, hatred, and love, it was a complete roller coaster! A beautifully written end to an amazing series. Highly recommended to everyone! 5 hearts! Brenda Pandos lives in California with her husband and two boys. She attempts to balance her busy life filled with writing, being a mother and wife, and spending time with friends and family. Working formerly as an I.T. Administrator, she never believed her imagination would be put to good use. After her son was diagnosed with an autism spectrum disorder her life completely changed. Writing paranormal romance became something she could do at home while tending to the new needs of her family, household and herself. Four years later, Brenda now has five books published, The Talisman Trilogy, Everblue, book 1 of Mer Tales, Evergreen, book 2 of Mer Tales. 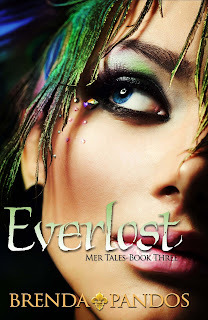 She is currently working on the third book of Mer Tales, Everlost, coming February 2013.